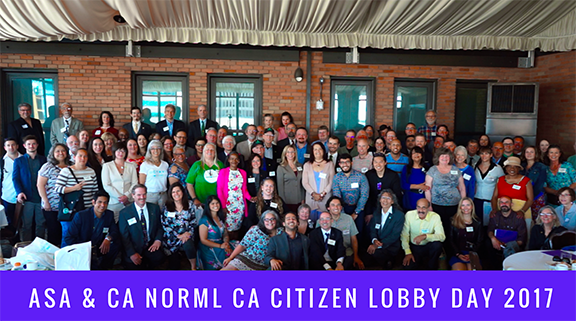 California NORML is once again teaming up with Americans for Safe Access to co-sponsor a Citizens Lobby Day in Sacramento on June 4, 2018. Lobby day begins with sign-in and a continental breakfast at 8:00 AM in the Metropolitan Terrace on the 7th Floor of the Citizen Hotel located at 926 J Street, Sacramento. If you have signed up in advance for lobby day, you will then receive your appointment times and locations for your representatives’ offices. If you haven’t signed up, you can visit a station where you can find out who your legislators are for drop-in appointments. The morning program starts at 9:00 AM, where we will present an overview of the bills on which we’ll be lobbying, along with tips for effective lobbying. You will then be armed with fact sheets on all the bills for your afternoon meetings with lawmakers, along with forms to report on your meetings. Bring the forms with you to the evening VIP reception for lawmakers and attendees in the Scandal Lounge back at the Citizen Hotel starting at 5:30 PM. Last year’s event was a success, with more than 200 patients, advocates, providers, industry workers, and others attending and lobbying their elected officials for marijuana reform bills. Lobby day efforts have resulted in a bill to protect employment rights for medical marijuana users, AB 2069, being introduced by Rep. Rob Bonta (Oakland). • SB 1302 (Lara) to end local delivery bans. • AB 1793 (Bonta), to to create a simpler and expedited pathway for Californians to have certain criminal convictions for cannabis-related offenses removed or reduced from their records. • SB 1127 (Hill) to allow for a parent or guardian to administer medicinal cannabis to a pupil at a schoolsite. • Two bills which would expand on the available venues for the sale and consumption of cannabis at temporary special events: AB 2020 by Asm. Bill Quirk (Hayward) and AB 2641 by Asm. Jim Wood (North Coast). Business bills that have been introduced or re-introduced this year include: AB1741 (Bonta), to allow for electronic tax payments for cannabis businesses; AB 1863 (Jones-Sawyer), to allow the deduction of business expenses for a licensed cannabis business under the state Personal Income Tax Law; AB 924 (Bonta) to direct the state to enter into agreements authorizing tribal cannabis activities; and SB 930 (Hertzberg), to establish a state-chartered bank that would allow for commercial cannabis activity in California. Supporters are urged to sign up in advance for lobby day so that organizers can make appointments with their representatives in the State Assembly and Senate. The cost for the day is $25, with no one turned away for lack of funds. Lobby day begins with a continental breakfast at 8:00 AM in the Metropolitan Terrace on the 7th Floor of the Citizen Hotel located at 926 J Street, Sacramento, CA 95814. The program starts at 9:00 AM. Meetings with lawmakers will take place in the afternoon, with an evening VIP reception for lawmakers and attendees in the Scandal Lounge at the Citizen Hotel starting at 5:30 PM. For more information about marijuana law reform efforts in California, you can also follow California NORML on FaceBook and Twitter! My favorite part of this article is the realization of the existence of a “Rastafarian Council” within the State Department. Just the thought of that brings me great spiritual joy. Looks like a comprehensive set of bills to address many issues. Hope to see some of them pass if not all of them! Peace be unto those who enter. The video us shot in a retired prison in California Damien bought and has turned into a cannabis growing facility and tourist destination. The poetic justice is quite palapable… visions of the sacred herb being grown where so many were unjustifiably detained. I like the prisoner sweeping cutting into an employee sweeping up the cuttings of some mj on the same floor. I may not be Rasafari, but Jah Bless the Marley’s and Rastas for what they are doing for our shared freedoms. We need to see more prisons turn into mj facilities… and vote in the laws to create the federal grants that foster these changes.